With my parents in town for a few more weeks, they encouraged us to take some time & book a mini getaway while they stayed home with the kids. Obviously, we didn’t hesitate to take them up on their offer since that’s not something we get to do very often! So, we found a cozy cabin & packed our bags for a long weekend in the mountains. We spent most of our time exploring in Old Forge, Inlet & Eagle Bay and didn’t venture further into the Adirondacks, mainly because it was freezing! We saw all kinds of wildlife, including a young buck (that walked right up to us!) & a white mink that I wanted to take home as a pet. On our first full day, the temperature was only 10 degrees, so I bundled up in sleek winter neutrals. 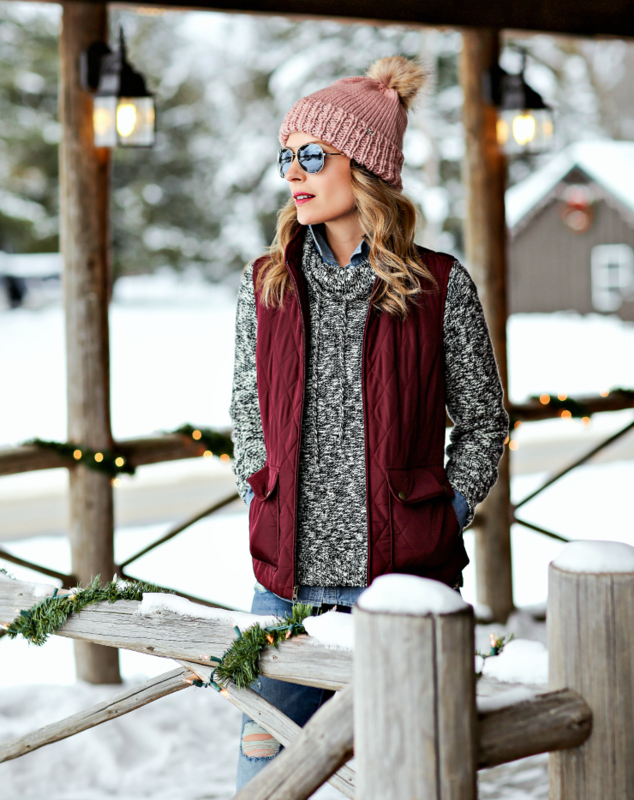 This cable-knit turtleneck is a classic wardrobe staple & comes in 12 different colors – it’s so warm & it passed my itch-free test (runs true to size – I’m wearing a Small). I topped it off with a statement plaid coat & these cashmere gloves, which would make a great stocking stuffer gift – use code SAVEMORE20 to get an extra 15% off! On day two, it was a little warmer, so I skipped my outerwear & instead chose casual layers for walking through town & doing some window shopping. 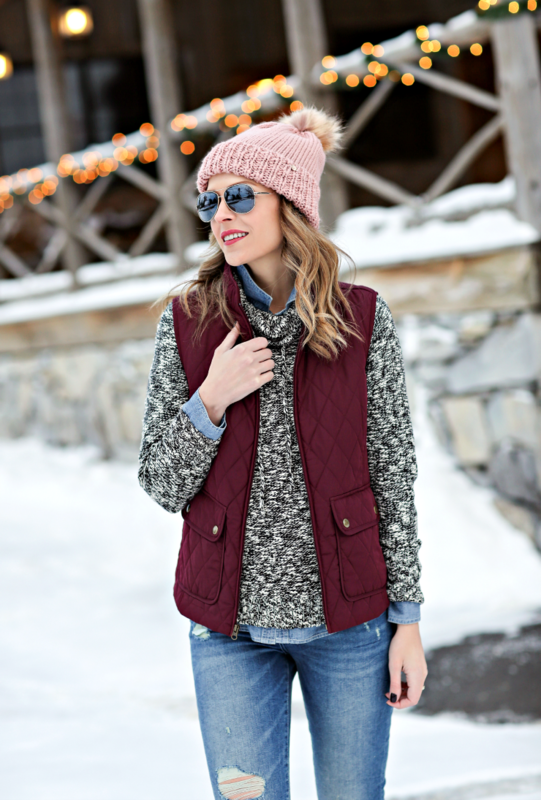 This quilted vest comes in 10 solid colors & 4 different prints and is on sale now for less than $13! I love that it has an adjustable drawstring in the back so you can cinch in the waist for a more flattering fit. I was also thrilled to have these short rain boots, which are so much easier to slip on & off than the taller styles – I wore these thick socks underneath & my feet stayed toasty warm all day long. One of my favorite things about Kohl’s is that I can find something for everyone in my family & that I know I’ll never have to pay full price. It’s the perfect place to find those last minute gifts because you can get them for less & right now you’ll earn $10 in Kohl’s cash for every $50 you spend to shop for yourself after the holidays. I picked up this retro stereo for my husband, this plush robe for my daughter, this indoor basketball hoop for my son and I plan on going back to get this velvet puffer jacket for myself – see more of the best sale finds here & in the scrolling bar below! Love your winter outfits and the post which is so in budget. These pictures are gorgeous! I love that black and white look! 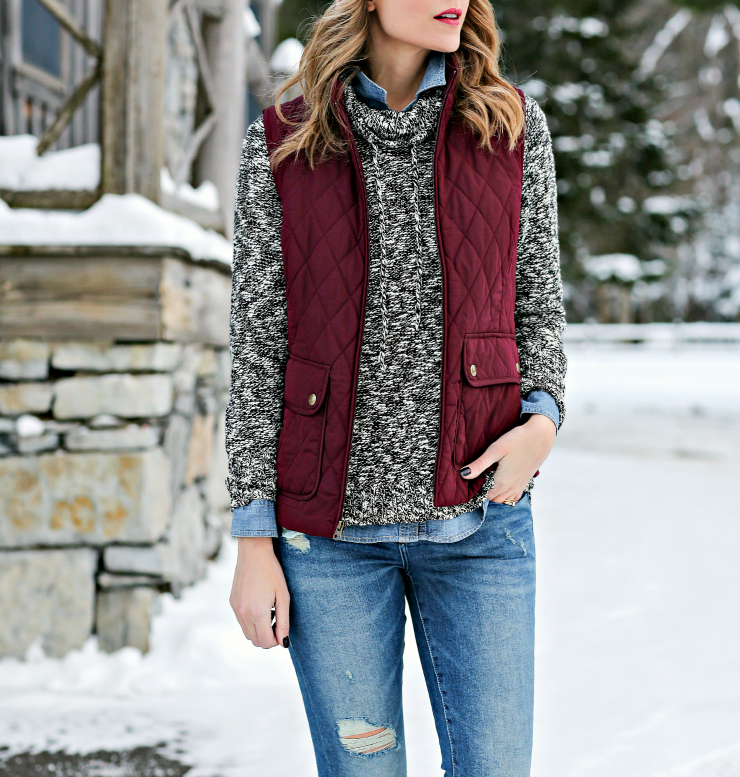 Amazing winter looks! Gorgeous photos! Ah so jealous! These photos are beautiful and that snow is everything!! These pictures are gorgeous! So fun! I love those outfits, that black/white top is so pretty! Those boots are so cute…but the link shows a brown buckle on the black boot. Did you remove the buckle? You’re right – that is so strange! I ordered these exact boots, but the ones I received didn’t have a buckle on them! What a beautiful winter wonderland! 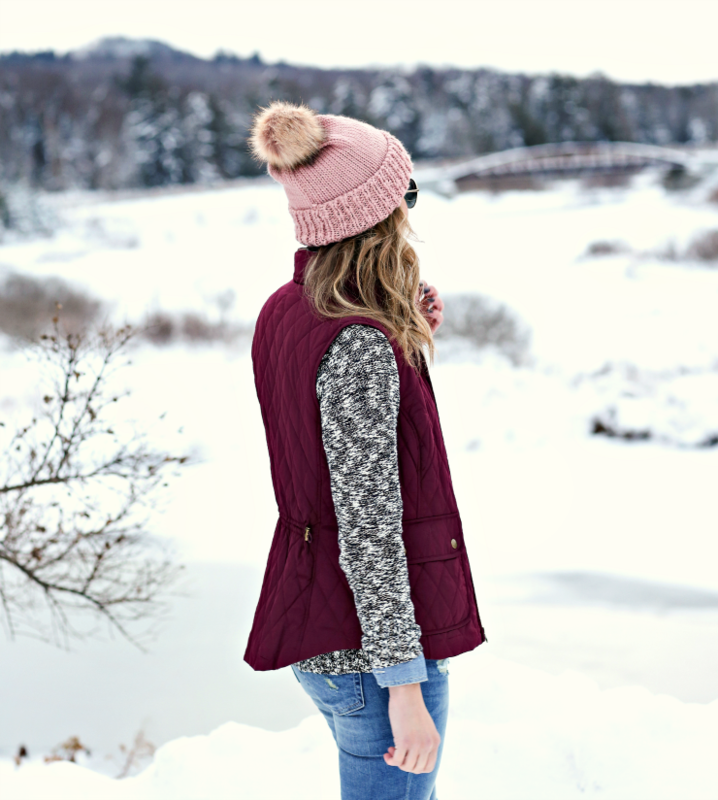 That maroon vest is my favorite! I love both looks so much!! What stunning pics!! What a surprise to be able to get away for a few days! Very nice surounding! Looks like a winter wonderland ! 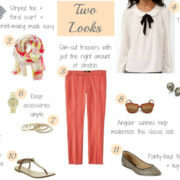 & love these outfits, they are both so cute! Both of your looks are lovely and you don’t look cold at all. I am loving these snowy background pics. Look at all that beautiful snow. Love your cold weather looks! I love both outfits, you look so pretty here! It look so beautiful there! That coat is gorgeous! I LOVE this black and white plaid coat on you and these photos are dreamy! Loving the boots, and your hats, and best of all that parents can take kids so you can go on a mini getaway! ?? This is so gorgeous! I hope I can take photos in the snow one day. These are absolutely magical. These photos are stunning!! And you look so adorable – loving that pale pink beanie! Definitely wouldn’t mind a mountain getaway myself. I love both of your winter looks! wow so gorgeous!! That white and black plaid coat is calling our names! so lovely! This sounds like so much fun! Good for you guys and getting away. We are headed to Michigan this week and I can’t wait. Obsessed with that plaid jacket!